Were we ever delighted to find this cool, rock themed line of boyswear from Addaboy. If you're up on your latest celebrity scoop, you'll also know that Gwen Stefani's son was recently spotted wearing one of Addaboy's tees. Not bad at all for the first year of this Made and Designed in Canada line. 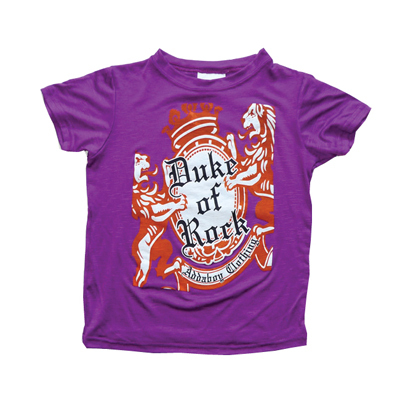 This cool and light purple Duke of Rock shirt shows you why. 95% rayon 5% spandex. Two left.